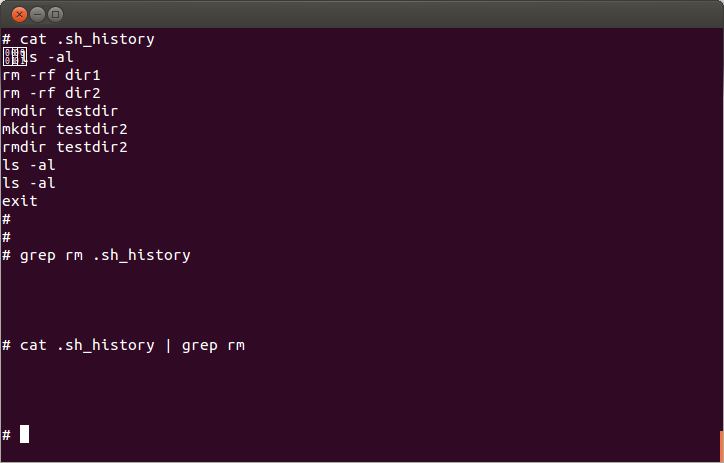 Also, if you run "file .sh_history" it will report as a "Ultrix-11 Stand-alone or boot executable". So the .sh_history file clearly has extra non-printable characters in it that are messing up our attempt to grep the file. The solution to this is to use the "strings" utility. strings will look through a binary file and display sections of printable characters out of it. So we can run "strings .sh_history | grep rm" if we want to search through the .sh_history file for "rm"
However, there is one small problem with this... By default "strings" will only print sequences of 4 or more printable characters. So if you ran the command "ls" and then ran "strings .sh_history" it wouldn't show the "ls" line because it is less than 4 characters. The solution to this is to run "strings -n 1 .sh_history | grep rm" which instructs "strings" to display all printable characters and thus every line in your .sh_history file will be searched by grep, regardless of length. In our example it doesn't make a difference since we don't have any commands less than 4 characters, but I just wanted to mention it in case anyone ever wonders why really short commands didn't show up with just the regular "strings .sh_history" command.